↑ Tak W. Mak; Mary E. Saunders (Ph.D.); Mary E. Saunders (2008). Primer to the immune response. Academic Press. পৃষ্ঠা. 28–. ISBN 978-0-12-374163-9. http://books.google.com/books?id=RX8-gd1tJRgC&pg=PA28। আহৰণ কৰা হৈছে: 12 November 2010. ↑ Warwick, Roger; Peter L. Williams. "Angiology (Chapter 6)". Gray's anatomy. illustrated by Richard E. M. Moore (Thirty-fifth সম্পাদনা). প্ৰকাশক London: Longman. পৃষ্ঠা. 588–785. ↑ Wisco, Jonathan. 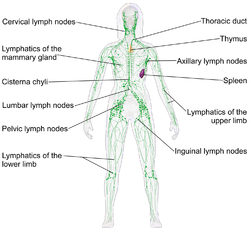 "Lymphatic System". AnatomyOne. Amirsys, Inc. https://app.anatomyone.com/systemic/lymphatic-system#। আহৰণ কৰা হৈছে: 26 October 2012.